Our CID Hay Grapple Bucket is a large capacity bucket with a grapple. It’s mainly used on a farm. It can be used for gathering broken bales of hay, straw, silage, and other light material. It can also carry a round bale of hay or multiple square bales of hay with this bucket. It is just a great bucket to have on your farm and can handle a lot of material for a reasonable price. 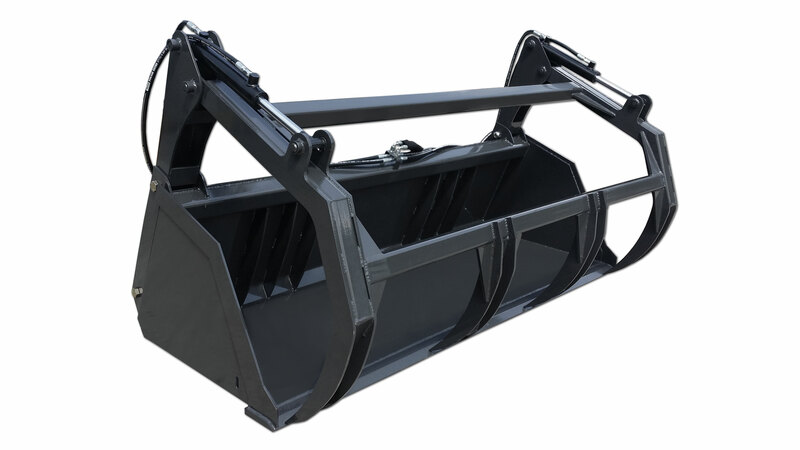 If you are in need of a large capacity bucket but have no use for the grapples, we recommend our CID Skid Steer Poultry Litter Bucket. The bucket can be viewed by clicking here. → CID Skid Steer Turkey Litter Bucket. 1/4″ wrap, 3/4″ x 6″ cutting edge. 2″ x 10″ cylinders, grease fittings at every hinge point. Gather up loose hay, carry round bale, or square bales.